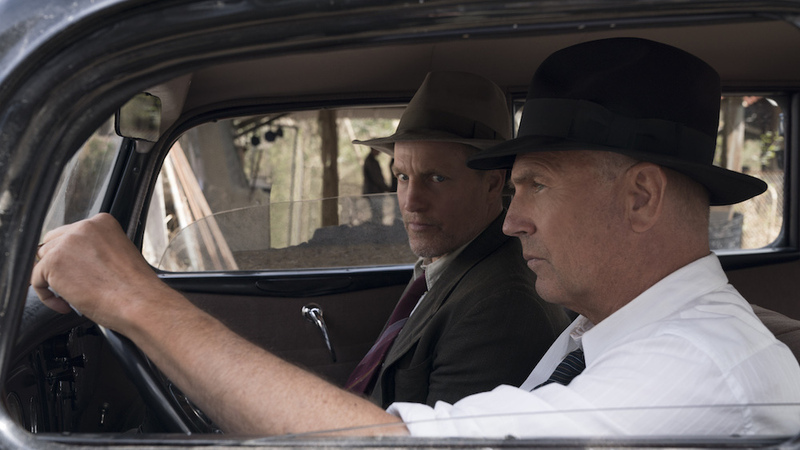 Plot – The true story of how aging one-time Texas Rangers Frank Hamer (Costner) and Maney Gault (Harrelson) bought about the end of the notorious criminals Bonnie and Clyde in America during the 1930’s. You wouldn’t think you’d say it, not when the film your referring to stars Kevin Costner and Woody Harrelson and is based around the true life story of the how criminal superstars Bonnie and Clyde were brought to justice after years on the run, but John Lee Hancock’s The Highwaymen is often downright boring. A new Netflix production that’s been highly promoted on the streaming service, Highwaymen on paper seems like a sure fire hit with the teaming up of long time Hollywood players Costner and Harrelson a great combo, director John Lee Hancock has runs on the board as a filmmaker with the likes of The Founder and The Blind Side, while a different look at the Bonnie and Clyde story that sees the focus shifted to the aging Texas Rangers that finally bought about an end to their rampage seems like a great way to tell this story but things only ever feel half-baked in this $50 million dollar production. Struggling to keep things moving through the rough start and stagnating middle-section, that features such important scenes as Costner’s coming out of retirement Frank Hamer starring across a lake or smoking cigarettes, Hancock never quite nails the tension or thrills that would’ve been evident on the tail of such notorious figures, while curiously Costner and Harrelson as Hamer’s long time offsider Maney Gault don’t ever really click, not particularly the actors fault as what they have to work with thanks to screenwriter John Fusco isn’t exactly world-class material. For such a high-profile streaming release and a film with a significant budget, it’s a shame much of the potential is dwindled away scene by scene as our eyelids grow heavy waiting for a big moment to come, but its few and far between as the only thrills we get are through the well-staged Bonnie and Clyde scenes that expertly keep their profiles hidden adding to a mystic and terror that showcases these criminals as not some type of Robin Hood heroes, but genuine cold blooded killers with nothing but murder and self-gain on their minds. The other issue with this slow moving and often ponderous exercise is you can’t help but escape the feeling things feels a little bit cheap and nasty. Sets feel amateurish, the wardrobe feels like it was borrowed from the leftovers of a TV show, while the films big chase scenes and gunfights all come and go with little pizzazz, it’s never a good thing when the most exciting sequence in your film is Kevin Costner chasing a weird orange haired man-child or Woody Harrelson attacking a bunch of men in a bathroom, but that’s exactly the type of problem Highwaymen faces. These type of problems should never have existed in a film in this space or with the talent involved, but sadly it’s the case and becomes yet another example of Netflix’s failures to turn potential into outcomes in the feature film department. Thanks to being a true story there’s still some good to be found here and it’s always nice to see Costner and Harrelson in lead roles but overall The Highwaymen remains a rather lifeless, dull and tiresome telling of events that were the polar opposite. A big missed opportunity. Totally agree with you on this one. I find it too long, too slow and without anything really memorable after 2+ hours. Great to see the leads but wish it was a better movie they starred in. Pretty disappointing really. Way to long for what it was, I was pretty excited for it but I just failed to really get into it. A typical Netflix disappointment. Totally on the same page on this… it plodded along and I completely lost interest. Normally I don’t find myself looking at the clock when watching a film, but this one had me really keen for the end credits. A big missed opportunity.